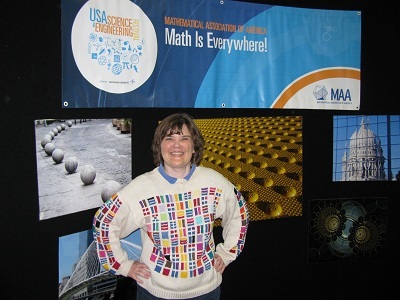 Yesterday I went to the US Science and Engineering Festival in DC, and made sure to stop at the Mathematical Association of America booth. I knew they’d be there because every day I make sure to do MAA Minute Math. I was hoping it would be cool enough (weatherwise) to wear my prime factorization sweater (For the explanation, follow the link! ), and to my joy it was. I was happy to get a picture taken at the MAA booth. Well, that got the attention of many more math people, and today I found four new comments on my blog post about the sweater and a page about me on Hacker News! My age will have five prime factors. My oldest son’s age will have four prime factors. My youngest son’s age will have three prime factors. In the year my oldest son was born, my age had four prime factors (as his does now). 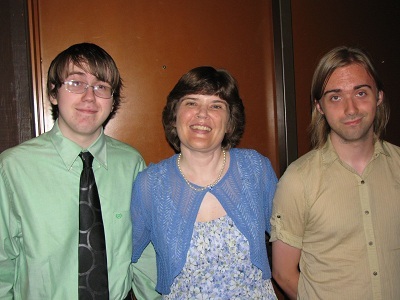 In the year my youngest son was born, my age had three prime factors (as his will this year). Let’s see. My youngest son’s age is still ambiguous. So I’ll add the clue that there are only three distinct prime factors in all the expressions above. That should do it. So, all this establishes that I was thinking about prime numbers yesterday. And, yes, I think it’s time to make a prime factorization cardigan, which I can wear in warmer weather. Some have said I should sell these. But let’s be honest. Having to buy all those shades of yarn costs around $100. Then it was definitely not my only knitting project, but it took me more than a year to knit. (Fun time, but not worth spending if it were for monetary gain and not for the fun of it.) Then it took me more than a month just to sew in all the yarn ends. Granted, if I made more with the same color scheme, that would spread out the cost. But by the time I finished, I’d had quite enough of the project. It has taken ten years for me to be at all interested in doing anything similar, and I’m NOT going to use the same yarn and color scheme as before; you can be sure of that. With a cardigan, you wouldn’t have room for a chart on both sides. So I was thinking about how else to express it. Last night, I ordered some Plymouth Encore yarn from yarn.com to make a scarf. Why Plymouth Encore? Well, first, it’s on sale right now. Needing 26 different colors to go up to 100, any savings per ball helps. I also decided that my cotton sweater (the original was made in Cotton Classic), while soft and comfortable, is a little bit droopy, and wasn’t the greatest choice for the intarsia work. Wool by itself risks being too scratchy. Most of all, this had enough colors, which I hope will be distinct. I think I’ll use a black background this time. I don’t look good in black is the one reason I didn’t use that on my sweater. (The original partial picture of a blanket that gave me the idea used a black background.) But in a scarf, the background won’t be as prominent. So here’s how it will work. I’ll start with however many rows of black looks good at the beginning. This is 1. Then I’ll choose a color for 2 and knit two rows (one ridge) in that color. Then I’ll do two rows of black. That represents a factor of 1, and also tells you that we’re starting on a new number. 3 will get two rows of a new color. Then two rows of 1. 4 is 2 x 2. So 4 will be expressed with four rows (two ridges) of the 2 color. Then two rows of 1. Then a new color for 5. Then two rows of 1. Then 6 = 2 x 3, so two rows of 2 directly followed by two rows of 3. Then two rows of 1. Get the idea? Numbers with lots of prime factors will take up more space than prime numbers. Mind you, I’ll swatch it out, with some different color choices, and see what looks best. (You definitely want your favorite colors as 2 and 3.) I will post pictures when I get there. Once I have a scarf done? Well, what I might try with a cardigan is a chart like the old sweater on the back (in new colors and yarn) and maybe stripes as in the scarf on the front sides. Or maybe I’ll be sick of it and give it a rest for awhile. Based on the new comments, it’s time for me to design a t-shirt! Stay tuned. I have written a children’s book which I called Colors and Codes that talks about using these ideas to make cyphers and patterns using colors or shapes combined with math. As part of the book, I made several charts on my computer. I will see how hard it is to transfer these charts to a t-shirt in Cafe Press. By the way, I haven’t tried to sell this book yet. I had been working on selling a middle grade novel, and lately I’ve been letting both efforts rest while I dealt with some medical issues. But if anyone knows of an agent or a publisher who’d like to take on something a little unorthodox but extremely cool to math geeks, let me know! It’s been about ten years since I designed and knitted the sweater. (So I was WAY young then!) Let me stress that the idea of visualizing the prime numbers through colors in knitting was not my own. By all means, spread the word! The article I read (and I should definitely track it down. It was in Interweave Knits in the late 90’s or 2000 or so.) talked about how the blanket that had been made inspired kids who didn’t think they were good in math. As I say in my book, you can attach the numbers to the letters of the alphabet and use these ideas to knit or color messages into things. The sky’s the limit, and it’s lots of fun. Once I have some swatches, I’ll take some pictures and post the results! “Across the Atlantic Ocean and far from the research laboratories and hallowed halls of Academia, a young girl, age thirteen, stands mesmerized in front of a knitted afghan displayed at the annual North-East Math Fair in Lancashire, England. Constructed of one hundred brightly colored squares, the intricately striped fabric is the creation of Pat Ashforth and Steve Plummer (www.woollythoughts.com). Knitters, teachers, mathematicians, and partners, Pat and Steve have found that basic mathematical principles make for beautiful knitwear designs, and that knitting is an excellent way of explaining complex theorems to their students. Now, they only had a photograph of a very small part of the afghan, so I couldn’t see how it worked. That part would not work on my sweater at all — there are several squares that appear to just be dark blue, and it’s stated elsewhere that green always appears with baby blue. So maybe that quilt is just showing factors of numbers, and not the prime factorization? Maybe beyond a certain point primes don’t get new colors? But anyway, having the fondness for math that I do, that much information made me realize that I could knit a prime factorization chart. But I wanted to wear it, not just look at it! I still can’t make sense of what, exactly, their afghan was doing, but they are the ones who gave me the idea behind my design. I graphed it out, figured out how many stitches across I needed, and then found a basic sweater pattern from the book Picture Knitting to use as my canvas. Thank you so much for the germ of the idea! This entry was posted on Sunday, April 29th, 2012 at 3:26 pm and is filed under Knitting, Mathematical, Prime Factorization. You can follow any responses to this entry through the RSS 2.0 feed. You can leave a response, or trackback from your own site. I just love your prime factorization cardigan! Would you mind if a quilter (me) made a quilt using your coloring idea? That would be AWESOME! Go for it! Be sure to post pictures online and send me the link when you’re done! I’m a little bit jealous — it will be easier to find that many different fabrics than it is to find that many colors of yarn.